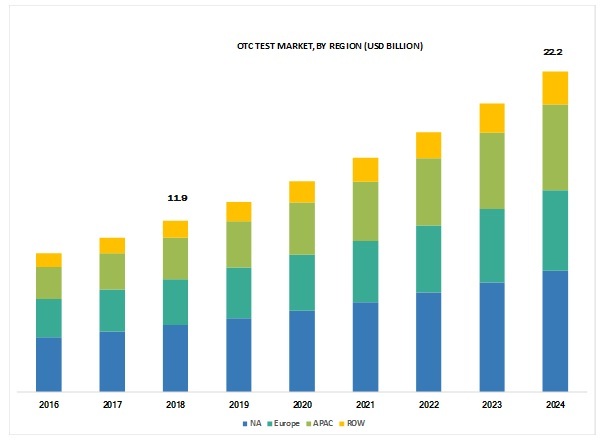 [96 Pages Report] The OTC tests market is projected to reach USD 22.2 billion by 2024 from USD 11.9 billion in 2018, at CAGR of 11.0% during the forecast period. The growth of the OTC tests market is mainly driven by the rising prevalence of target diseases and disorders, such as diabetes and infectious diseases, both prominent ailments across the globe that require rapid and effective testing. 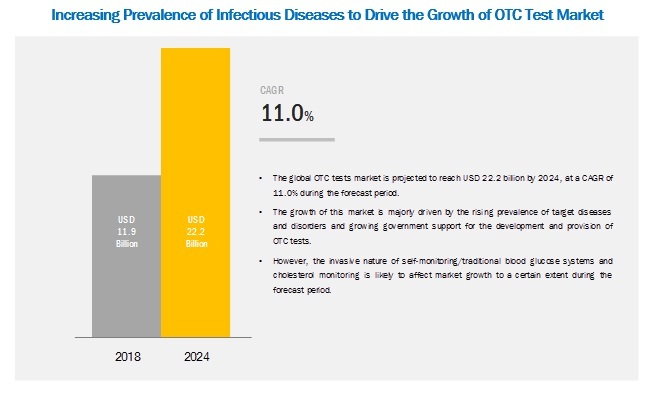 By product type, infectious disease tests are expected to be the fastest-growing segment in the OTC Test market during the forecast period. The infectious disease tests segment is projected to grow at the highest CAGR between 2018 and 2024. Growth in this market can be attributed to factors such as the increasing number of HIV-infected individuals across the globe, coupled with increasing availability and awareness about HIV OTC testing in emerging markets such as India, Brazil, and China. By technology, the lateral flow assays segment is growing at the highest rate. The market in the Asia Pacific is growing at the highest CAGR during the forecast period. The Asia Pacific is estimated to grow at the highest CAGR during the forecast period. The high growth in this regional segment is majorly attributed to the increasing patient population base and the growing prevalence of infectious diseases. The key players operating in the OTC tests market are OraSure Technologies (US), Roche Diagnostics (Switzerland), and i-Health Lab (US). A majority of the leading players in the market focus on both organic and inorganic growth strategies such as collaborations, partnerships, acquisitions, and agreements to maintain and enhance their market shares in the OTC tests market. In 2019, SD Biosensor launched STANDARD GlucoNavii GDH for blood glucose monitoring. In 2019, LabStyle Innovations entered into an agreement with Better Living Now (BLN) for the distribution of its blood glucose monitoring system and the DarioEngage digital health platform. In 2018, DarioHealth partners with Byram Healthcare to further expand insurance health coverage for consumers in the US. Who are the major market players in the OTC Test market? What are the regional growth trends and the largest revenue-generating regions for OTC Test market? What are the major drivers and challenges in the OTC Test market? What are the major product segments in the OTC Test market? What are the major technology segments in the OTC Test market? The study involved four major activities for estimating the current market size for OTC Test. Exhaustive research was conducted to collect information on the market as well as its peer and parent markets. The next step was to validate these findings, assumptions, and sizing with industry experts across the value chain through primary research. Both top-down and bottom-up approaches were employed to estimate the complete market size. Thereafter, market breakdown and data triangulation were used to estimate the market size of segments and subsegments. This research study involved the use of widespread secondary sources; directories; databases such as D&B, Bloomberg Business, and Factiva; white papers; annual reports; and companies’ house documents. Secondary research was used to identify and collect information for this extensive, technical, market-oriented, and commercial study of the global OTC Test market. 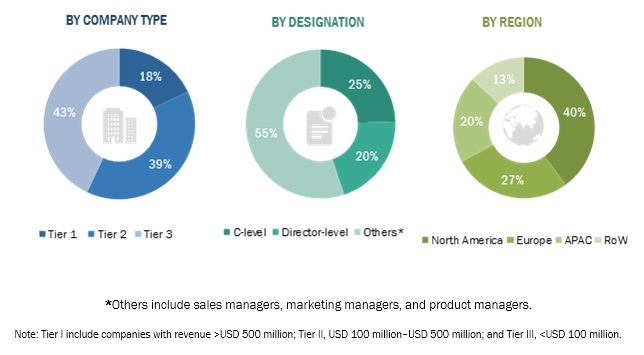 It was also used to obtain important information about the top players, market classification and segmentation according to industry trends to the bottom-most level, geographic markets, key developments related to the market, and technology perspectives. A database of the key industry leaders was also prepared using secondary research. The report presents a detailed assessment of the global OTC Test market, along with qualitative inputs and insights from MarketsandMarkets. Both top-down and bottom-up approaches were used to anticipate and validate the size of the global OTC Test market and estimate the sizes of various other dependent sub-markets. The procedure included the study of the annual and financial reports of top market players and extensive interviews with industry leaders such as CEOs, VPs, directors, and marketing executives for key insights. All percentage shares, splits, and breakdowns were determined using secondary sources and MarketsandMarkets repository and verified through primary sources. All possible parameters that affect the markets covered in this research study have been accounted for, viewed in extensive detail, verified through primary research, and analyzed to get the final quantitative and qualitative data. The above-mentioned data is consolidated and added with detailed inputs and analysis from MarketsandMarkets and presented in this report. The market forecast provided in this study was arrived at after a detailed assessment of various qualitative and quantitative factors, such as historical revenue growth trend of leading players; major market growth drivers and restraints, and their impact over the forecast period; innovation trends; and relevant macro and micro-economic indicators. However, the forecast for top-level markets and subsegments does not account for the effects of inflation, economic downturns, exchange rate forecast, and any unforeseen regulatory and policy changes over the forecast period of 2018–2024. After arriving at the overall market size-using the market size estimation processes explained above-the market was split into several segments and subsegments. To complete the overall market engineering process and arrive at the exact statistics of each market segment and subsegment, data triangulation and market breakdown procedures were employed, wherever applicable. The data was triangulated by studying various factors and trends from both the demand and supply sides of the OTC Test industry. To define, segment, and estimate the global market size for OTC Test.